The DJ is what brings the party to life and helps creates a memorable evening for you and all your guests. Our experienced DJ has played at hundreds of events and weddings across Scotland. 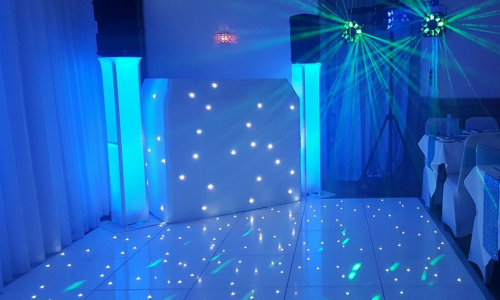 Whatever your event may be whether it is a wedding, birthday party, engagement party or anniversary you can be sure he will have your dance floor filled all night long. 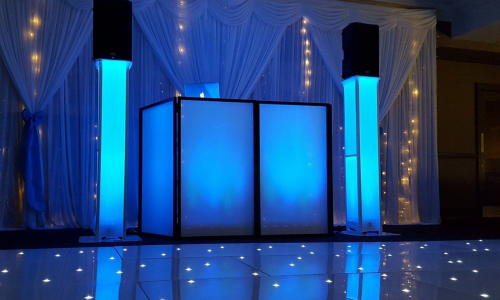 Traditional DJ setup which includes disco lighting, speakers and a microphone for speeches and announcements. Playlist suggestions and favourite songs can be Emailed in advance for your evening. Karaoke option available contact for more details. Our eye catching elegance package instantly lets your guests know they are in for a night of partying. DJ setup including booth, speakers and lights. Top of the range speakers scaled up or down to match the size of your venue. Playing from 7pm till midnight. 2 x LED light columns. 2 x beam sweeping lighting effects. Our premium DJ wedding package comes with a breathtaking setup and is complimented with top of the range audio and visual equipment. 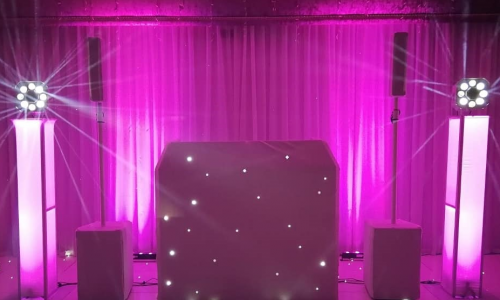 Full white DJ setup including booth, speakers and lights. Text a song feature for guests. Pre wedding meeting available to discuss your big day in detail including first dance and any personal favourites for your evening. Free travel in Glasgow and the west of Scotland. Playing from 7pm till midnight with break during evening buffet. Arrive 1.5 hours early to do a full setup which includes lighting and sound check. LED uplights behind DJ booth. Have the lights to match your colour theme or have the lights interact with the music. Our professional wedding DJ will have your guests dancing long into the wee hours. 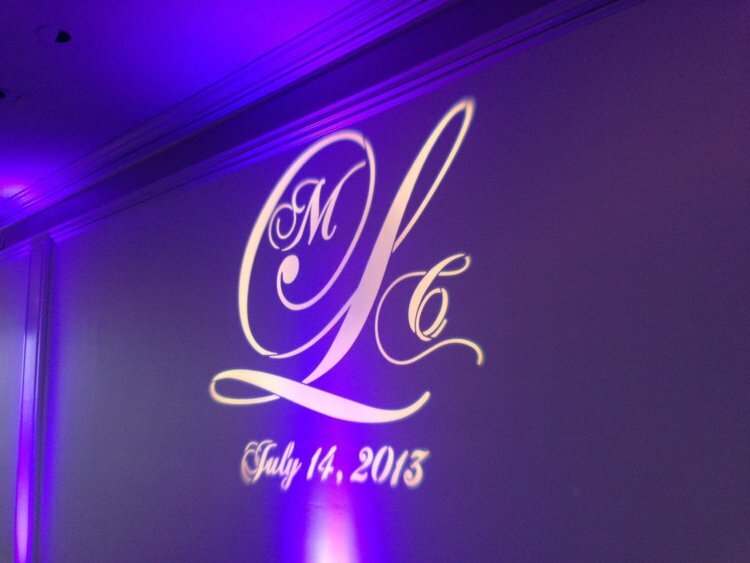 A personalised monogram LED is a great focal point for any event. We can design it to have your initials and wedding date, personalised birthday message or even your corporate logo. Only available when booking one of our elegance packages. 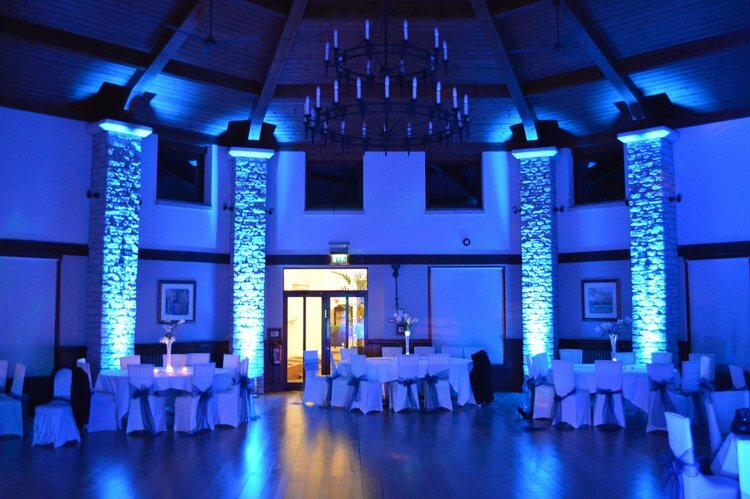 Why not add in our LED uplighting kit to your event. Our 8 LED up lights come battery operated so no cables and you can choose the colour to fit in with your chosen colour scheme. Hiring a DJ for your wedding, party or event couldn’t be easier with Crest Events. We are happy to help answer any and all questions about our DJ packages. Call us today on 0141 266 0044 or use the contact button and find out if your date is still available.